Can you imagine working a nine-hour shift and then having to wait on a crowded bus for an extra 90 minutes just so the superstar employee and his entourage can have their own 70-seat tour bus just to themselves? Making matters worse, this all took place at 12:30 in the morning. After calling “Dream: Fight for Japan. How Are You! New Year! 2011″ for HDNet, legendary play-by-play announcer Michael Schiavello took to his Twitter to voice his displeasure in the “diva”-like behavior that Fedor Emelianenko (Pictured) and his M-1 Global team showcased after the Russian collected his knockout victory over Satoshi Ishii. “Lots of Fedor love after Ishii win. 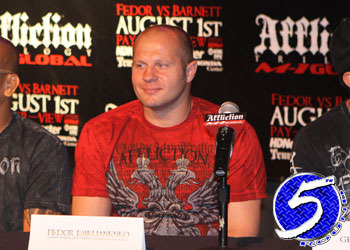 Back to back for Fedor but I’d like to see a true test of his current mettle against a better name,” Schiavello stated. “BTW Fedor is SUCH a DIVA! Other fighters & us sat on bus for about 90 min after show because Fedor apparently needs a bus all to himself! Even Bibi Fernandes and his team were booted off the second bus because “that is Fedor’s bus,” mind you these are like 70 seat tour buses! “Seriously, it was just plain RUDE. Fighters want to get to their hotel we ALL HAD TO WAIT & Bibi had to clear off the Fedor bus. If greats like Hoost, JLB, Sefo, Schilt, Hunt, Hug, Aerts etc can all bus share, Fedor can too. “Fancy booting Bibi Fernandes & his team off ONE BUS and onto the other more crowded one. Dude just won the B/W GP! Not to mention sitting there for 90 mins on a bus at 1230am waiting, waiting, waiting… I get the “special treatment” thing but hey, hire a small private van or a limousine, I’ve seen that done before. Don’t keep others waiting. Tim Sylvia, a former Fedor foe who also participated in the New Year’s Eve extravaganza, took up for Emelianenko. Sylvia believes the shuttle demands most likely stemmed from “The Last Emperor’s” representatives and not the heavyweight. “I don’t think it’s fedor I think it’s his people. He is not like that at all,” Sylvia tweeted. “Thanks Tim, I think so too. Trouble is that management reflects on their clients, hence this reflects on Fedor,” Schiavello wrote in response.